Win A Year's Worth of Free Gym Wipes! 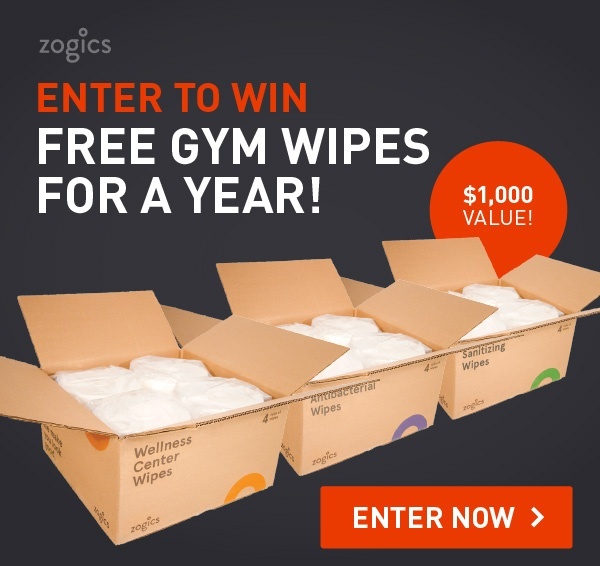 How does free gym wipes for a year sound? Pretty dang good, right? Well, if you enter our Free Gym Wipes Sweepstakes you stand a good chance of winning 6 cases of gym wipes of your choice. You can choose from Zogics premium Antibacterial Gym Wipes, our bestsellling Wellness Center Wipes, or our economical Sanitizing Wipes. Hurry! This sweepstakes ends Nov. 10, 2016, so head to our sweepstakes page now to submit your entry. We will notify the winner via email on November 11th. Good luck! Plus, earn up to 20 additional entries by sharing our sweepstakes and tagging #Zogics on Facebook and Twitter for an additional 10 entries each! No purchase necessary. See here for more details.